Large whales don't have too many predators, and predation was not previously thought to be a serious threat to right whales. However, four cases of such attacks— three resulting in death and one bite mark on a live calf — are detailed in an article recently published in Marine Mammal Science, Shark Predation on North Atlantic Right Whales (Eubalaena glacialis) in the Southeastern United States Calving Ground (Taylor et al. 2012). Although predatory attacks are likely limited to debilitated and young whales, in a species where other threats such as entanglements and vessel strikes compromise the health of a large portion of the population, it may be more of a concern than previously thought. Killer whales (Orcinus orca) and several species of sharks could be responsible for attacks on right whales. Bite marks on some members of the population have been attributed to killer whales, but these marks are typically very different from those seen on the 2009 season calf, Catalog #3945. The tooth marks from killer whales appear as a series of parallel lines that are typically seen on the whale's fluke tips (Figure 2). The semi-circular jagged marks on Catalog #3945 (Figure 1) located on his right flank are more consistent with a shark bite. Overlapping migratory routes further indicate that white sharks (Carcharodon carcharias) could be responsible. White sharks will scavenge opportunistically to supplement their diet, and cases of this have been documented in the southeast (Figure 3). But it would appear that predatory attacks are also happening. The paper discusses results from three necropsies that determine attacks ocurred before death, i.e. they were predatory as opposed to scavenging events. The 2009 calf survived an attack that could have happened within the first five days of its life - what a way to enter the world! The whale is now three years old and was recently named "Sharkbait" by the North Atlantic Right Whale Consortium's voting members. 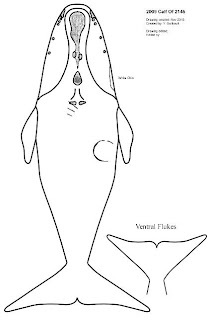 It still bears the distinctive scar which will likely remain as one of his identifying features, and has been incorporated into the whale's composite (Figure 4). Figure 4. Composite of Catalog #3945 "Sharkbait". 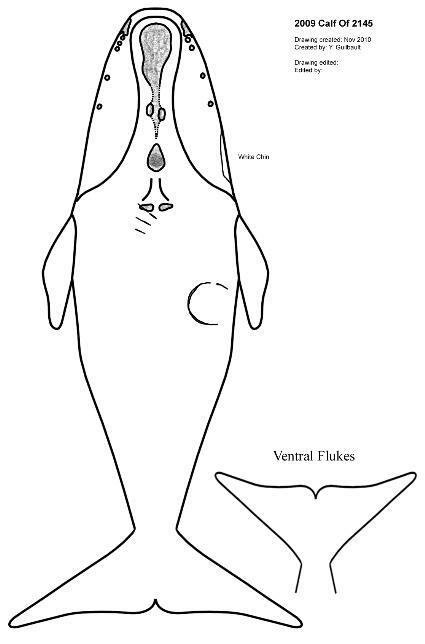 Researchers use these drawings to detail all of the unique features of each whale in the population to help identify and track individuals. 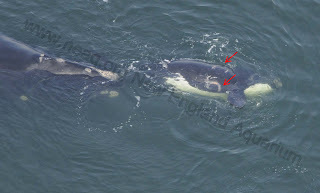 Two of the four cases studied involved right whales that were entangled in fishing gear around the time of the attacks: one was the subject of a major disentanglement effort (Catalog #3911), and the other had V-shaped markings on the peduncle indicating a net entanglement (2006 Calf of #1802). Implications of these findings are of particular importance to this endangered species where 83 percent display signs of unique entanglements. Even if predation is an indirect cause of death following serious injury from other causes, it contributes to decreasing the chance of recovery of the species. In order to arrive at the conclusions drawn from these four cases, a huge collaborative effort was drawn upon including histology from necropsy events; white shark satellite tracking; and the right whale photo-ID Catalog with contributions from scientists all along the U.S. Eastern Seaboard and Canada. This is yet another paper that exemplifies the need to continue the various disciplines of right whale research if we are to get a concise, accurate picture of the state of this population and the pressures that it faces.